Every summer since 1980, Austin native Tyrone Wideman has celebrated his summer birthday with his family at the Taste of Chicago. “I took my son in a stroller,” Wideman said about attending the very first Taste of Chicago with his then-1-year-old baby. 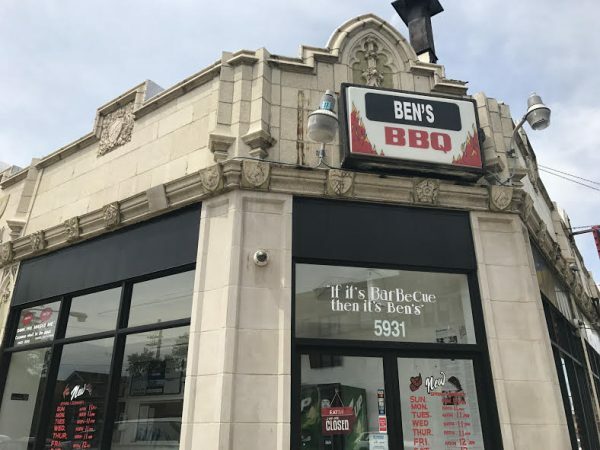 The tradition will continue this year, except Wideman and his wife, Linda Leslie, who co-own Ben’s Bar-Be-Cue, located at 5931 W. North Ave., will be participating as one of 67 vendors selected for the annual food festival. It will be held at Grant Park July 5 to 9. Ben’s is one of 17 newcomers this year. The lineup includes four five-day vendors, six food trucks and seven pop-up restaurants, plus music. Most come from Chicago’s North Side. Ben’s is the first Austin restaurant to be part of Taste since at least 2012; the city’s records aren’t clear before then. So this might be the first year an Austin vendor is participating, Wideman said. Located at the corner of North Avenue and Austin Boulevard, Ben’s is best known for its spare ribs, turkey tips and chicken tips. These are the signature items, Wideman said, that they will be serving from 11 a.m. to 9 p.m. Wednesday through Friday and 10 a.m. to 1 p.m. on Saturday and Sunday at Grant Park. The family applied to be part of the food festival in late November along with other 75 applicants across the city. After rounds of meetings and inspections, they learned in March they had made the cut. But the joy lasted just a few minutes, Wideman said, because it also means a lot of work. Since 2007, the couple has operated the restaurant, which used to be known as Joe’s BBQ. They renamed it after a relative. It has expanded from eight employees to 16 this year– most of whom live on Chicago’s West Side – and more than 50 items on the menu. “We serve anywhere from 800 to 900 customers a week,” said Wideman, who turns 67 this year and lives three blocks from Ben’s. “We cook fresh food every day,” he added, unlike other restaurants that pre-cook food or use ingredients left over from the previous day. Wideman credits the recipes and the healthy choice of sauces to his wife, who’s from New Orleans. That’s why, he said, everything at Ben’s “has a New Orleans tweak,” especially their chicken wings. The barbecue has attracted a pack of faithful customers from both Austin, surrounding neighborhoods – and beyond. Nancy Orr, who lives in Oak Park, said a lot of people will make the trip Downtown to eat Ben’s this week. “I’m glad to see a BBQ place owned by a family on our side of the town participating in the Taste of Chicago,” said Holman, who has been to the festival several times and plans to be there Wednesday, the first day. Ben’s popularity stems not only from the food but its efforts to hire “the hardest-to-employ” in Austin – an act, Wideman and his wife believe, is necessary to reduce crime in the community. Most of their employees have served time in prison – the longest, Wideman said, for more than 20 years. This year, the restaurant received a TIFWorks grant from the city for recruiting ex-offenders from the neighborhood. The prize, Wideman said, will subsidize them to hire another 16 people. That’s why, he said, it’s important for Austin businesses to recruit from the neighborhood. “You open up a business, try to do well, and get robbed or even shot,” said Wideman, adding doing business in Austin has not been easy. Although that hasn’t happened at Ben’s, Wideman said, he knows customers and workers have been robbed at other stores. But if you give people a chance to work, he said, they feel encouraged, “even if you just have them do some minor things. The 37th Ward alderman will hold two more gatherings June 11 and 18 to discuss issues important to residents.